On Saturday, the No. 4 Men’s Lacrosse team (10–1) was met with its first heartbreak of the season, losing a tightly contested 10–9 battle against their NESCAC rivals, the No. 6 Wesleyan College Cardinals (8–2). The defeat marks the Jumbos’ first loss since May 16, 2018, when the Jumbos were defeated by the Cardinals in another one-score, 12–11 loss in the NCAA Quarterfinal. The Cardinals went on to win the NCAA Championship. It was an electric start in Middletown, Conn., with both teams fully understanding the game’s playoff implications. The Cardinals were first to get on the board when senior midfielder Scott Irwin scored early in the first quarter from an assist by junior attacker Tom Martello. In characteristic Jumbo fashion, senior attacker and co-captain Danny Murphy, who was named a NESCAC co-player of the week on March 25, scored back-to-back goals to put Tufts up 2–1 with just over nine minutes remaining in the first quarter. The lead was short-lived, however, as the Cardinals went on to score three straight goals to close out the first quarter with a 4–2 lead. 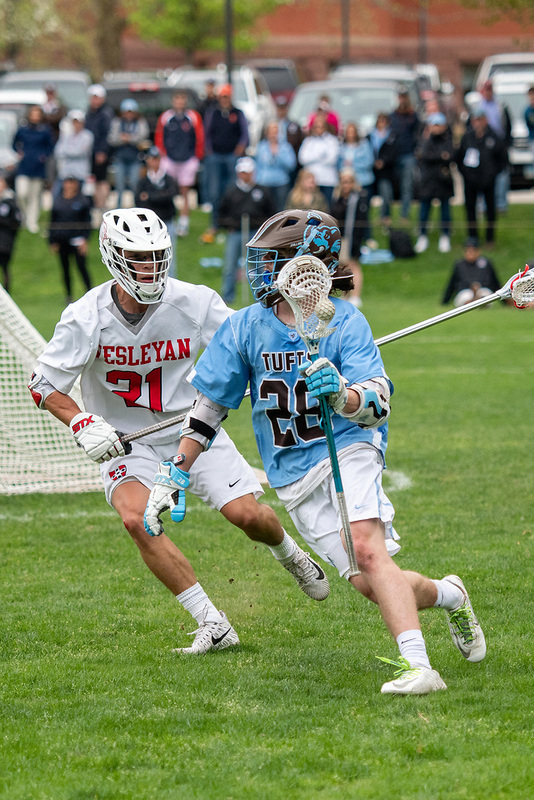 Tufts’ defense stepped up big time in the second quarter, limiting Wesleyan to only one goal. With just under five minutes remaining in the quarter, Jumbo sophomore attacker Max Waldbaum scored from an assist by Cardinal junior attacker Matt Treiber to cut the deficit to one. Waldbaum’s goal proved to be instrumental in catalyzing the electric offensive quartet of the Jumbos which pillaged the Cardinals’ nest for the remainder of the half. Waldbaum, Murphy, Treiber and senior attacker and co-captain Ben Connelly, who sits atop the team in goals scored with a combined 115 out of the Jumbos’ 195 goals of the season, went on a four-goal drive to give the Jumbos a 6–5 halftime lead. Tufts head coach Casey D’Annolfo commented on what he believed led to the team’s success toward the end of the first half of the game. The second half consisted of back-and-forth scoring which resulted in four game-tying goals for Wesleyan. Tufts took an inch, and Wesleyan took it right back. Neither team ever led by more than a goal after this point, making for Tufts’ toughest game of the year thus far. It was in the last minutes of the game that the tide finally changed for the Jumbos. After an unassisted goal for Wesleyan by senior midfielder Zander Kotsen to tie the game at 9–9, the game was held scoreless for over seven minutes as both teams struggled to find a goal. With just over two minutes remaining in the game, Wesleyan senior midfielder and co-captain Christian Barker proved himself a hero for the Cardinals, scoring the final goal of the match to put Wesleyan ahead 10–9. The Jumbos, whose last score came with over 12 minutes remaining in the game, were unable to find the back of the net in the final two minutes and were sent packing home with their first loss of the season. D’Annolfo praised Wesleyan’s performance as top NESCAC contender. Saturday’s game came fresh off the cusp of another one-point game for the Jumbos. On Wednesday, the Jumbos faced off against another one of their NESCAC rivals in the Williams Ephs (8–2), where the Jumbos came out on top in a close 15–14 battle. The Williams game served as a good indicator of areas where the Jumbos, who base a large portion of their play-style in lacrosse’s fundamentals, stand to improve. Murphy spoke about one of the fundamentals that the Jumbos pride themselves in: ground balls. Echoing the words of one of his star players, D’Annolfo also stressed how important focusing on the fundamentals will be for the Jumbos moving forward. Following the results of this week’s NESCAC play, the Jumbos move on with a record of 10–1, currently tied with the No. 2 Amherst College Mammoths (10–1, 5–1) for the second seed in the NESCAC conference. No. 12 Bates (9–2, 6–1) leads the NESCAC pack. As if its last week wasn’t hard enough, Tufts faces two of Div. III’s most talented teams. On Saturday, they face off against Amherst, and, on Tuesday, April 16, they’ll battle the top team in the NESCAC, Bates.